This topic provides information on configuring Remote Direct Memory Access (RDMA) interfaces with Hyper-V in Windows Server® 2016 Technical Preview, in addition fo information about Switch Embedded Teaming (SET). In editions of Windows Server previous to Windows Server 2016 Technical Preview, it is not possible to configure RDMA on network adapters that are bound to a NIC Team or to a Hyper-V Virtual Switch. In Windows Server 2016 Technical Preview, you can enable RDMA on network adapters that are bound to a Hyper-V Virtual Switch with or without Switch Embedded Teaming (SET). In Windows Server® 2012 R2, using both RDMA and Hyper-V on the same computer as the network adapters that provide RDMA services can not be bound to a Hyper-V Virtual Switch. This increases the number of physical network adapters that are required to be installed in the Hyper-V host. In Windows Server 2016 Technical Preview, you can use fewer network adapters while using RDMA with or without SET. The image below illustrates the software architecture changes between Windows Server 2012 R2 and Windows Server 2016 Technical Preview. The following sections provide instructions on how to use Windows PowerShell commands to enable Data Center Bridging (DCB), create a Hyper-V Virtual Switch with an RDMA virtual NIC (vNIC), and create a Hyper-V Virtual Switch with SET and RDMA vNICs. Before using any RDMA over Converged Ethernet (RoCE) version of RDMA, you must enable DCB. While not required for Internet Wide Area RDMA Protocol (iWARP) networks, testing has determined that all Ethernet-based RDMA technologies work better with DCB. Because of this, you should consider using DCB even for iWARP RDMA deployments. If you have a kernel debugger installed in the system, you must configure the debugger to allow QoS to be set by running the following command. If SET is not required for your deployment, you can use the following PowerShell script to create a Hyper-V Virtual Switch with an RDMA vNIC. Using SET teams with RDMA-capable physical NICs provides more RDMA resources for the vNICs to consume. New-VMSwitch -Name RDMAswitch -NetAdapterName "SLOT 2"
This section provides an overview of Switch Embedded Teaming (SET) in Windows Server 2016 Technical Preview, and contains the following sections. SET is an alternative NIC Teaming solution that you can use in environments that include Hyper-V and the Software Defined Networking (SDN) stack in Windows Server 2016 Technical Preview. 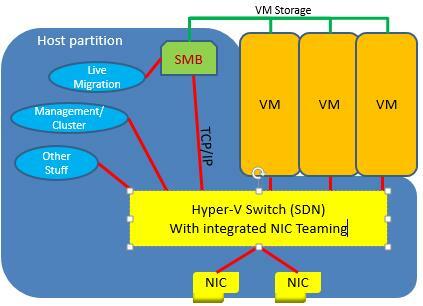 SET integrates some NIC Teaming functionality into the Hyper-V Virtual Switch. SET allows you to group between one and eight physical Ethernet network adapters into one or more software-based virtual network adapters. These virtual network adapters provide fast performance and fault tolerance in the event of a network adapter failure. SET member network adapters must all be installed in the same physical Hyper-V host to be placed in a team. The use of SET is only supported in Hyper-V Virtual Switch in Windows Server 2016 Technical Preview. You cannot deploy SET in Windows Server 2012 R2. In addition, you can connect your teamed NICs to the same physical switch or to different physical switches. If you connect NICs to different switches, both switches must be on the same subnet. The following illustration depicts SET architecture. Because SET is integrated into the Hyper-V Virtual Switch, you cannot use SET inside of a virtual machine (VM). You can, however use NIC Teaming within VMs. For more information, see NIC Teaming in Virtual Machines (VMs). In addition, SET architecture does not expose team interfaces. Instead, you must configure Hyper-V Virtual Switch ports. SET is available in all versions of Windows Server 2016 Technical Preview that include Hyper-V and the SDN stack. In addition, you can use Windows PowerShell commands and Remote Desktop connections to manage SET from remote computers that are running a client operating system upon which the tools are supported. You can use any Ethernet NIC that has passed the Windows Hardware Qualification and Logo (WHQL) test in a SET team in Windows Server 2016 Technical Preview. SET requires that all network adapters that are members of a SET team must be identical (i.e., same manufacturer, same model, same firmware and driver). SET supports between one and eight network adapters in a team. SET is compatible with the following networking technologies in Windows Server 2016 Technical Preview. Hyper-V Network Virtualization - NV-GRE and VxLAN are both supported in Windows Server 2016 Technical Preview. Receive-side Checksum offloads (IPv4, IPv6, TCP) - These are supported if any of the SET team members support them. Transmit-side Checksum offloads (IPv4, IPv6, TCP) - These are supported if all of the SET team members support them. SET is not compatible with the following networking technologies in Windows Server 2016 Technical Preview. Unlike NIC Teaming, when you create a SET team, you cannot configure a team name. In addition, using a standby adapter is supported in NIC Teaming, but it is not supported in SET. When you deploy SET, all network adapters are active and none are in standby mode. Another key difference between NIC Teaming and SET is that NIC Teaming provides the choice of three different teaming modes, while SET supports only Switch Independent mode. With Switch Independent mode, the switch or switches to which the SET Team members are connected are unaware of the presence of the SET team and do not determine how to distribute network traffic to SET team members – instead, the SET team distributes inbound network traffic across the SET team members. When you create a new SET team, you must configure the following team properties. When you create a SET team, you must specify up to eight identical network adapters that are bound to the Hyper-V Virtual Switch as SET team member adapters. The options for SET team Load Balancing distribution mode are Hyper-V Port and Dynamic. VMs are connected to a port on the Hyper-V Virtual Switch. When using Hyper-V Port mode for SET teams, the Hyper-V Virtual Switch port and the associated MAC address are used to divide network traffic between SET team members. When you use SET in conjunction with Packet Direct, the teaming mode Switch Independent and the load balancing mode Hyper-V Port are required. Because the adjacent switch always sees a particular MAC address on a given port, the switch distributes the ingress load (the traffic from the switch to the host) to the port where the MAC address is located. This is particularly useful when Virtual Machine Queues (VMQs) are used, because a queue can be placed on the specific NIC where the traffic is expected to arrive. However, if the host has only a few VMs, this mode might not be granular enough to achieve a well-balanced distribution. This mode will also always limit a single VM (i.e., the traffic from a single switch port) to the bandwidth that is available on a single interface. This load balancing mode provides the following advantages. Outbound loads are distributed based on a hash of the TCP Ports and IP addresses. Dynamic mode also re-balances loads in real time so that a given outbound flow can move back and forth between SET team members. Inbound loads are distributed in the same manner as the Hyper-V port mode. The outbound loads in this mode are dynamically balanced based on the concept of flowlets. Just as human speech has natural breaks at the ends of words and sentences, TCP flows (TCP communication streams) also have naturally occurring breaks. The portion of a TCP flow between two such breaks is referred to as a flowlet. When the dynamic mode algorithm detects that a flowlet boundary has been encountered - for example when a break of sufficient length has occurred in the TCP flow - the algorithm automatically rebalances the flow to another team member if appropriate. In some uncommon circumstances, the algorithm might also periodically rebalance flows that do not contain any flowlets. Because of this, the affinity between TCP flow and team member can change at any time as the dynamic balancing algorithm works to balance the workload of the team members. VMQ and SET work well together; VMQ should be enabled whenever you are using Hyper-V and SET. SET always presents the total number of queues that are available across all SET team members. In NIC Teaming, this is called Sum-of-Queues mode. Most network adapters have queues that can be used for either Receive Side Scaling (RSS) or VMQ, but not both at the same time. Some VMQ settings appear to be settings for RSS queues but are really settings on the generic queues that both RSS and VMQ use depending on which feature is presently in use. Each NIC has, in its advanced properties, values for *RssBaseProcNumber and *MaxRssProcessors. Following are a few VMQ settings that provide better system performance. The team members' processors should be, to the extent practical, non-overlapping. For example, in a 4-core host (8 logical processors) with a team of 2 10Gbps NICs, you could set the first one to use base processor of 2 and to use 4 cores; the second would be set to use base processor 6 and use 2 cores. SET is fully compatible with Hyper-V Network Virtualization in Windows Server 2016 Technical Preview. The HNV management system provides information to the SET driver that allows SET to distribute the network traffic load in a manner that is optimized for the HNV traffic. Live Migration is supported in Windows Server 2016 Technical Preview 4, but is not supported in Windows Server 2016 Technical Preview 3. When you configure a SET team with dynamic load distribution, the packets from a single source (such as a single VM) are simultaneously distributed across multiple team members. To prevent the switches from getting confused and to prevent MAC flapping alarms, SET replaces the source MAC address with a different MAC address on the frames that are transmitted on team members other than the affinitized team member. Because of this, each team member uses a different MAC address, and MAC address conflicts are prevented unless and until failure occurs. When a failure is detected on the primary NIC, the SET teaming software starts using the VM's MAC address on the team member that is chosen to serve as the temporary affinitized team member (i.e., the one that will now appear to the switch as the VM’s interface). This change only applies to traffic that was going to be sent on the VM’s affinitized team member with the VM’s own MAC address as its source MAC address. Other traffic continues to be sent with whatever source MAC address it would have used prior to the failure. It is recommended that you use System Center Virtual Machine Manager (VMM) to manage SET teams, however you can also use Windows PowerShell to manage SET. The following sections provide the Windows PowerShell commands that you can use to manage SET. When you create the Hyper-V Virtual Switch, you must include the new EnableEmbeddedTeaming parameter in your command syntax. In the following example, a Hyper-V switch named TeamedvSwitch with embedded teaming and two initial team members is created. The EnableEmbeddedTeaming parameter is assumed by Windows PowerShell when the argument to NetAdapterName is an array of NICs instead of a single NIC. As a result, you could revise the previous command in the following way. If you want to create a SET-capable switch with a single team member so that you can add a team member at a later time, then you must use the EnableEmbeddedTeaming parameter. The Set-VMSwitchTeam command includes the NetAdapterName option. To change the team members in a SET team, enter the desired list of team members after the NetAdapterName option. If TeamedvSwitch was originally created with NIC 1 and NIC 2, then the following example command deletes SET team member “NIC 2” and adds new SET team member “NIC 3”. Set-VMSwitchTeam -Name TeamedvSwitch -NetAdapterName "NIC 1","NIC 3"
You can remove a SET team only by by removing the Hyper-V Virtual Switch that contains the SET team. Use Remove-VMSwitch to remove the Hyper-V Virtual Switch. The following example removes a Virtual Switch named SETvSwitch. The Set-VMSwitchTeam cmdlet has a LoadBalancingAlgorithm option. This option takes one of two possible values: HyperVPort or Dynamic. To set or change the load distribution algorithm for a switch-embedded team, use this option. In the following example, the VMSwitch named TeamedvSwitch uses the Dynamic load balancing algorithm.